Become a member of America’s longest underground automated shooting range with programmable target retrieval systems and lanes over 150-YARDS! The Range is truly one of a kind with 24 stations including rifle, pistol, archery, plus (FATS®) Firearms Training Simulation and Golf Simulation rooms. This state-of-the art 50,000-sf facility also includes our two-story Sporting Shoppe, VIP members lounge, reach-in humidor, and more. 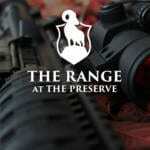 Plus, The Preserve Academy offers a wide curriculum of firearms classes for all skill levels. Additional membership packages available, click here for more info. The Preserve at Boulder Hills reserves the right to institute price changes. Typing errors and misprints are not binding. Membership packages are subject to change. The Range at The Preserve at Boulder Hills is a private range/shooting club located on property owned by The Preserve at Boulder Hills. This reservation agreement is binding. The Range at The Preserve has the right to decline any application. *Subject to NICS/BCI check. Proceed to make payment with debit card, credit card or PayPal.